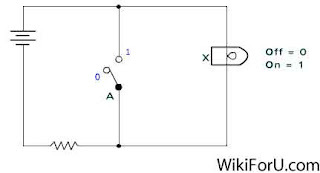 In Digital Electronics we come across a term that is logic gates. The basic logic gates are OR, AND and NOT gates. Logic gates are basically a decision making devices. Different logic gates have their different-different applications. Above is the symbol of inverter. The inverter has one input and one output. The operation of inverter is inversion or complementation, thus it converts one to zero and zero to one that is high to low and low to high. Technically inverter is not a gate. Because it has only one input and one output.So we can also tell it NOT gate. We can see that when input is zero or low it gives high or one at output that is inverts the input. When we give high or one at input it gives low or zero at output. In above circuit, at left side we have connected the battery. Switch key is referred as input and LED or bulb represents output. Closed switch key means high input and opened switch key means low or zero. Glowing LED represents high output and if its OFF, it represents low at output. If switch is open, circuit will not complete and hence the LED will not glow showing low at output. But when switch key is closed, the circuit will complete and shows high at output. The overbar shows inversion. 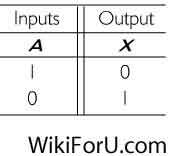 This can be read as : X is equal to NOT A, means that output is invert of the input logic state. If input is one, the output will zero and vice versa.